Wigan manager Uwe Rosler says his tactics in the FA Cup quarter-final win over Manchester City were inspired by former Latics boss Roberto Martinez. Martinez, who is now in charge at Everton, led Wigan to victory over City in last season's FA Cup final. "I studied Roberto's tactics last season at Wembley and he had a very brave game-plan," said Rosler. "I also watched the league game at the Etihad last season and Roberto's team played some periods to perfection." City won the top-flight match with a late winner against Wigan but went on to lose the FA Cup final against the same opponents. Rosler added: "We tried to replicate parts of that but also bring our own identity in terms of our pressing and counter-attacking." The Latics, who are chasing a play-off place in the Championship, will play Arsenal in the semi-finals as they head back to Wembley for the fourth time in 12 months, while City's hopes of a domestic Treble came to an end. Jordi Gomez fired Wigan ahead from the spot and James Perch made it 2-0 after half-time when he beat Gael Clichy to convert James McArthur's cross. 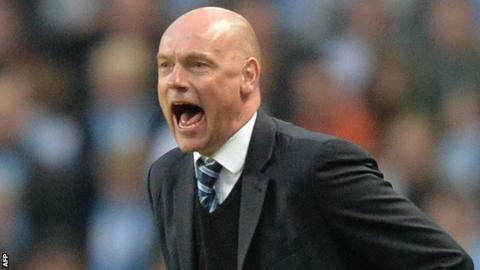 "To win - and the way we won - is my biggest achievement as a football manager," Rosler said. City, who won the Capital One Cup at Wembley last weekend, only managed one effort at goal in the first half but improved in the final 30 minutes. They replied through Samir Nasri after 68 minutes, but could not force an equaliser thanks to some heroic Wigan defending. One challenge in particular stood out: when Emmerson Boyce stopped Edin Dzeko from scoring what looked an almost certain goal from point-blank range with a last-ditch tackle. "That was unbelievable," said Rosler. "But I am a big believer that you need match-winners at both ends - not only in the attacking box but also in your own box. "That tackle by Emmerson was a decisive moment for us but so was the tackle by Perch when he scored our second goal. "Both tackles demonstrated the desire and will-power we had. Emmerson is a symbol of that, not only with this result but since I walked into the club." Rosler, who is still seen as a hero by City fans after his four-year spell with the club as a player in the 1990s, did not celebrate his success at the final whistle but says he is now looking forward to facing Arsenal. "To win the FA Cup last season was an unbelievable achievement that put Wigan on the worldwide football map," Rosler said. "I never thought we would do it again and be in the semi-finals. "The players deserve all the credit, but if you ask a young manager who wants to climb up the ladder if he wants the chance to play Arsenal at Wembley, then of course I would take that."